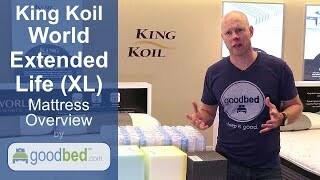 The King Koil World Extended Life mattress collection includes four models, all constructed with plus-size individuals in mind. Is Bellevue Luxury Firm the right bed for you? Do you have a King Koil Bellevue Luxury Firm mattress? Write a Review! There are no reviews on GoodBed for the Bellevue Luxury Firm yet. Be the first. Have a question about the Bellevue Luxury Firm? The Bellevue Luxury Firm is a tight top spring core medium mattress model that is manufactured by King Koil. Have an update or correction to our information about King Koil Bellevue Luxury Firm? If so, please take a moment to suggest an edit. Showing stores with King Koil products nearest to Houston, TX. Call store first to confirm availability.